Comments: A selenium rectifier was used in the bias circuit. Two speaker jacks were wired in parallel were located under the chassis. 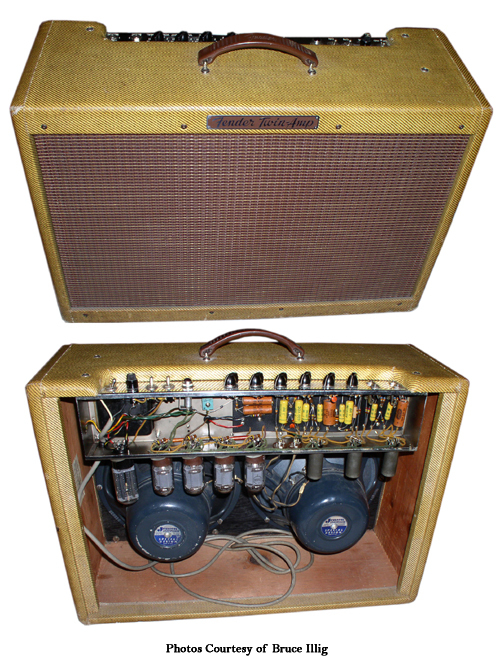 I found this exact same amp in my fathers home after his death. It works amazingly well. I would grade as in very good condition. Could you tell me who might be able to give me a ballpark figure on the value. J. Bonamassa is also a huge Fender Twin guy, and is approachable sort of. Or at least as approachable, as the pursuit of a vintage Fender amp makes him…ha! Fender just come out with Joe Bonamassa’s Signature Tweed Twin Narror Panel March 2019.